A drilling machine, called a drill press, is used to cut holes into or through metal, wood, or other materials. Drill presses for occasional use in general-purpose machine shops usually have only one spindle. For drilling several holes successively or simultaneously in a workpiece, machines with multiple spindles are available. When large quantities of identical mechanical components are required, special-purpose drilling machines, with spindles arranged in a variety of positions relative to the workpiece, can be constructed. Although drill presses are used mainly for drilling holes, they can also be used for enlarging holes with a boring tool or finishing holes with a reamer. With the aid of a special tapping attachment and a tap, they can produce threads in a hole. Our inventory is continually being updated, if you do not see what you are looking for please call our office, a salesperson will be happy to assist in finding the right new or used machinery for your shop needs. 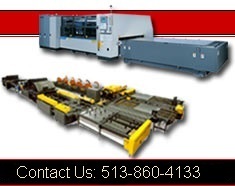 CINCINNATI Precision Machinery 513-860-4133. And Our Sales Staff Can Assist You In Finding A Used Drill Press.